BOTOX® Cosmetic is the most commonly performed cosmetic procedure used to reduce or eliminate the appearance of facial wrinkles through minimally invasive injections. These injections are made from botulinum toxin A, a therapeutic muscle-relaxing agent approved by the FDA for several different uses. When injected into the skin, it can block the nerve muscles that are responsible for the repetitive actions that cause fine lines and wrinkles, smoothing them away for a younger and more refreshed appearance. After treatment, the appearance of your wrinkles begins to improve within 24 hours, with full results developing gradually over the next five days. Most patients achieve their desired results after just one injection, although additional treatment sessions may be required in the future. The results of Botox injections typically last up to four months, with some patients reporting results lasting up to a full year. Dysport® injections are ideal for nearly anyone wishing to reduce the appearance of fine lines and wrinkles on the face and restore a younger, more refreshed appearance. The injections are administered directly into the facial muscles that cause frown lines and other wrinkles; these injections are generally painless, with no need for anesthesia. Treatment sessions typically take less than 15 minutes, and are administered at six-week intervals. 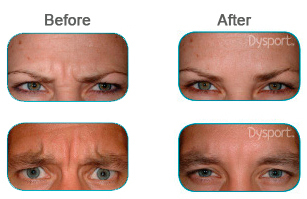 Three to five injections are usually required to achieve desired results. When we are young our skin is smooth and elastic with a healthy glow. As we age, our ability to maintain that smoothness and elasticity diminishes, resulting in skin that becomes drier, thinner and less able to replenish itself. Our body's natural collagen and hyaluronic acid levels decrease and our skin becomes looser. This leads to our skin wrinkling and appearing older than it should. Since no pre-testing is required, a Restylane treatment can be performed almost immediately. It usually takes about 30 minutes depending on the type of correction you want. Most people find the injections relatively painless, but a topical anesthetic can be applied to the area prior to your treatment. You will be able to see the results as soon as your treatment is completed. Restylane, manufactured by a unique method in Sweden, is clear transparent gel composed of hyaluronic acid, a natural substance that is found throughout your body. Hyaluronic acid gives volume to your skin and has been used as a lubricant in arthritic joints. It has even been used during eye surgery to protect the retina. The hyaluronic acid found in Restylane is not of animal or human origin which means that there is no risk of disease transmittal or allergic reaction, which you might find in other cosmetic fillers. There is no need for skin tests and the risk of side effects is very low. The results will be seen immediately. Perlane® is an injectable filler used to treat deep facial lines, augment the lips and contour the cheeks and chin. Made by the same company that produces Restylane®, Perlane contains purified hyaluronic acid, a sugar found naturally in the body that works with collagen to keep the skin smooth and supple. It is hypoallergenic and does not require a pre-treatment skin test. With its unique ability to bind with water, Perlane continues to perform up to 60% longer than collagen. Perlane injections typically take 30 to 45 minutes to perform, and are administered with a topical anesthetic. Patients can return to regular activities immediately after injections, with no downtime. Results are visible right away and can last for six to eight months, depending on the individual patient's age, skin condition, and various other factors. Touch-up injections once or twice a year are recommended to maintain results. © 2011 Aesthetica Spa M.D. & Dermatology Laser Center and MedNet Technologies, Inc. All Rights Reserved. Glendora, Covina, Phillips Ranch, San Bernardino, Fontana, Corona and the surrounding area.